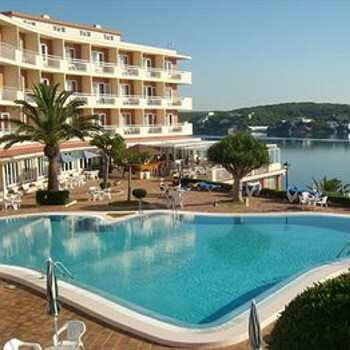 The Rey Carlos III Hotel is in a brilliant location overlooking Mahon harbor. There is no beach but you can swim off the rocks below the hotel, as the locals did. It was wonderful watching the boats/ships coming and going all day long. All double rooms have sea view, most single rooms to the front of the hotel overlooking the road(not busy). I would say the hotel is mostly suited to the over 40 bracket and wouldn't recommend it for children. The rooms are spotlessly clean, although dated - no tea making facilities so take own kettle etc. Rooms were quite large with TV - only sport/news channels in English. All doubles had balcony and sea views. The food was excellent both breakfast and evening meals with a wide variety to pick from - 9/10. The pool was great with two areas for sun bathing, the bottom area was directly over the sea, great. It is a quiet hotel but we were told that in August it does get very noisy. The most fantastic position on the harbour leading to Mahon. Rooms are basic but spotless. The whole of the hotel is spotless and the staff are lovely. The terraces (3) are wonderful spots for watching the yachts/motor cruisers and cruise ships go by. Not much going on around the hotel. Entertainment only once a week. Overall a very nice hotel for a relaxing holiday. The Hotel is perched on a hill overlooking the entrance to Mahon Harbour giving spectacular views. Most guests were in the more mature age group. The Hotel is well maintained and the staff very helpful and friendly. There wasn't a great deal of choice at mealtimes, but it was usually good. There was entertainment once a week, but we didn't see it. A good hotel for a quiet holiday in pleasant surroundings.